Because the open concept design is so popular in home design today, there is a lack of walls to place furniture on. My couch layouts are floated in rooms and end up with their backs exposed and visible. To create a more decorative look I recommend adding sofa tables or console tables that can be accessorized or made to be repurposed for useable added space. Today’s post shows ways you can design your own sofa table that looks great and cost little to make or have made. This is a great use of space. It adds additional seating to a room which would be wonderful for small apartment living. Even in a small space, you could have lot’s of people over for game night, it’s very clever. This would not be hard to make or hire someone to make it. The design is a contemporary industrial look and a very popular trend. If you were not into the rustic style you could create other style sofa tables just by changing the wood and replacing the steel pipes. It is the concept that I think is clever. Here is a farmhouse style, simplistically designed. You can use sofa tables as additional storage which is always useful. The “X” design really jazzes up what would have been a pretty boring couch back. Choosing a bright color can really add excitement to your room. If you have neutral furniture this might be a great idea. 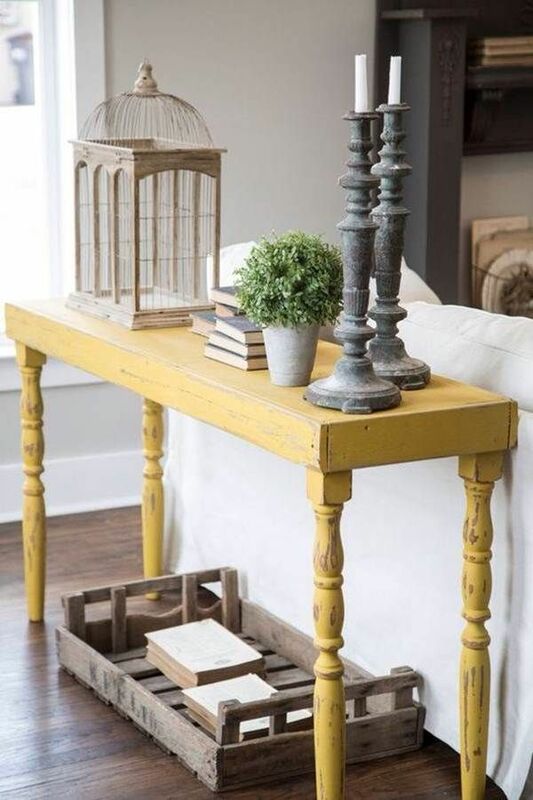 The bright yellow console table has a rubbed through finish and sets up perfectly to introduce some accessories to the room. A console table used as a desk works great. Whether you are in need of a message center or an actual desk to work at this could make a great spot. As long as you don’t keep a messy desk this would make a nice multipurpose piece of furniture and work well in a small room. Your DIY sofa table doesn’t have to be perfect when placed behind a couch and wall. This is a smart way to add extra table top space where it might come in handy like for lamps to add additional lighting to an open living room. Many times in an open living room concept there are not floor outlets to plug in lamps and you have a problem with exposed cords. The console table behind the couch makes it easy to hide ugly cords and be able to plug in lamps. You might even consider designing a charging station here to charge your devices.